Placebo, London, running and happiness headaches! That was one of my last tweets from London, where I just spent two days having the time of my life. But, as this is a running blog, I’m not going to go on and on about Placebo and the gig (even though I could, just ask my friends!). It’s the second day I spent in London that’s relevant here; on Wednesday I became a running tourist for a day. Some people, myself included, go to London to see the sights; Tower of London, Big Ben, Buckingham Palace etc etc. I’ve been to London more times than I can count and I’ve seen all those sights before so this trip I wanted to do something different. I wanted it to be a running holiday! By that, I don’t mean I went for a run although I had every intention of going! I brought my gear and had checked out a park the day before but on Wednesday I decided not to go running. Guilt free too! I don’t feel bad at all about not going running in London. But my day WAS devoted to running related things! Firstly, after a morning to myself (British Museum=awesome! ), I met the very cool and down to earth guys from @100kmtobrighton, ASD and Si. I had contacted them ages ago to say I’d be in London this week and could I meet up with them to hang out. To my delight, they said yes! So we met for lunch and hung out and chatted about running and twitter and other random things. It was so much fun to meet them! These two, ASD and Si, are fun, friendly, interesting, comfortable and humble people. The podcasts they did from last year were so inspiring and interesting; I felt like I knew them as friends already. Meeting them in person is definitely a highlight of my year so far. I felt like we chatted like old friends would and I could have stayed chatting for longer than we did! They aren’t on twitter much anymore but I recommend reading over their blog if you haven’t already. ASD has written about an Ironman he did as well on the blog. Awesome stuff! I put out the call for ideas for running shops to visit and got some great responses! I ended up going to The Running Works on Houndsditch and I’m so glad I did! It’s no wonder they win customer service awards, the staff are such friendly, knowledgeable, interesting people and I felt really comfortable hanging out in the store. I ended up getting a running shirt (my first ladies running shirt! More on that in a future blog post!) and some socks (boring, I know!) and we had a great chat about shoes and running styles. I wish, when the time comes to get new shoes, I could go back to their shop for them. But with flights and accommodation, those would be some expensive shoes! Next time I am in London though, I will stop by the shop again. 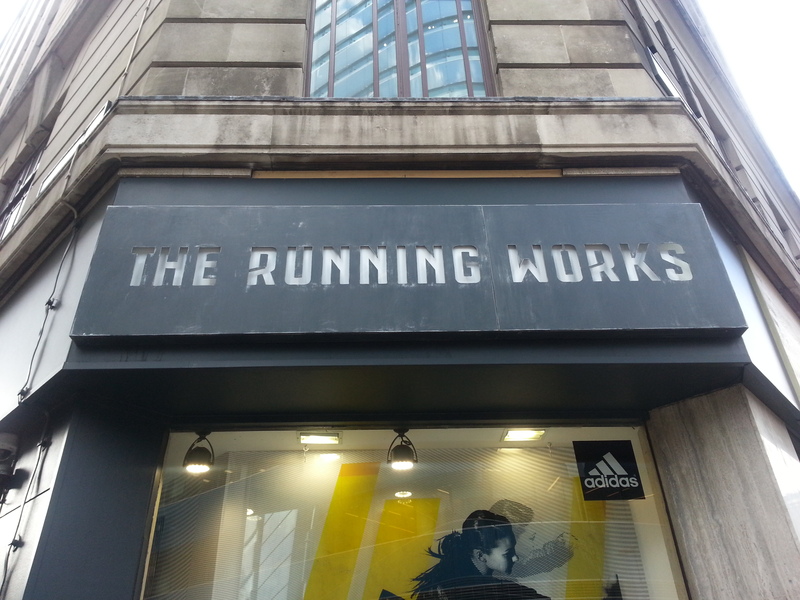 Check them out on twitter @RunningWorks and if you’re ever in London, definitely look them up! 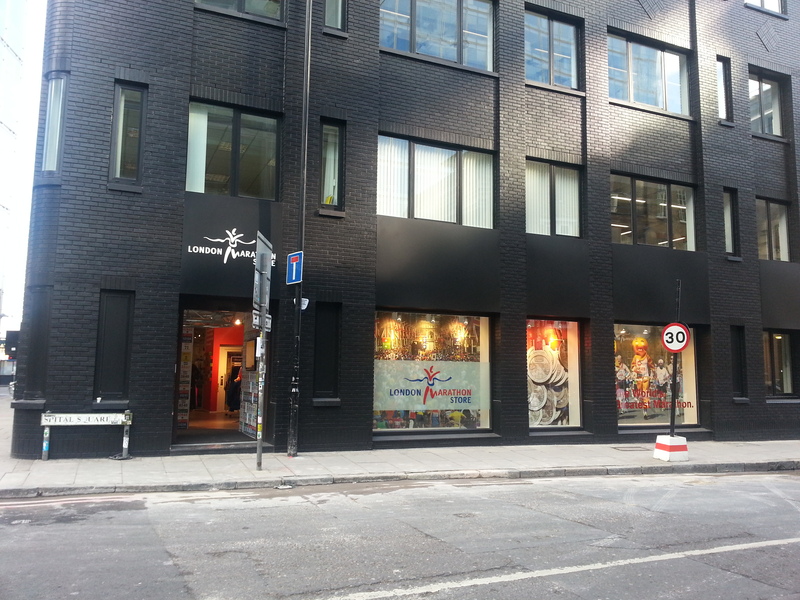 After that I legged it up to the London Marathon Store, which I’d heard about previously because I watch the London Marathon every year online. The shop was bright and staff really friendly. I wish I had had more time to hang out there. It was great finding out about their facilities and running clubs. The rhino costume (that apparently weighs a ton but people run the marathon in it anyway!) in the doorway was really cool, I’m glad they pointed it out to me because I’d walked right past it! I didn’t buy anything there except for a Gu energy gel which I don’t even really need but I’ve heard about them and wanted to try one! After the Marathon store I had to head for the airport. I’d had such a great time and spent most of the day with a huge grin on my face that I ended up with a headache! A happiness headache! The pain was all worth it though. I’d do it all over again in a heartbeat! So thank you, London, for a fabulous two days, they were amazing, epic, hectic, wonderful, wonder-full, awesome and unforgettable! 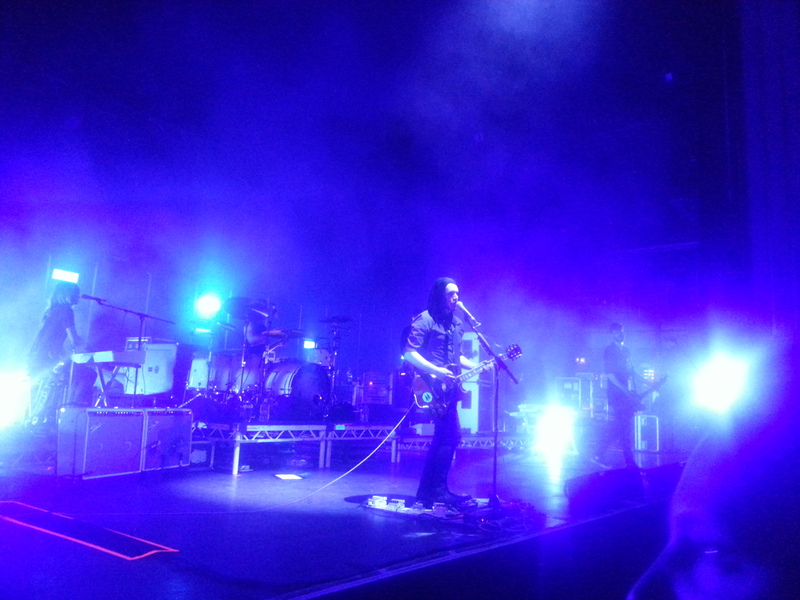 Thank you, Placebo for an amazing gig and newfound friends (you know who you are!). Thank you, The Running Works (and Jess!) for the new running kit and great conversation. I wish you had a shop in Dublin! Thank you, London Marathon store (and Steve) for the tour and the Gu and the laugh over the rhino! Goodbye, London; it's been epic! Stay awesome!